Ray, a young British-Asian woman arrives in the afternoon heat of a small village in India. She has come to live there for several months to make a documentary about the place. For this is no ordinary Indian village - the women collecting water at the well, the men chopping wood in the early morning light have all been found guilty of murder. The village is an open prison. Ray is accompanied by two British colleagues and, as the days pass, they begin to get closer to the lives of the inhabitants of the village. And then it feels too close. As the British visitors become desperate for a story, the distinction between innocence and guilt, between good intentions and horrifying results becomes horribly blurred. 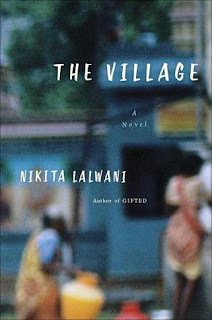 It took me awhile to warm up to The Village but once I got into it, I really did enjoy it as it told me about a part of India that I did not realize existed before. I am a great fan of fiction set in India, so it was refreshing to learn something new. I had to look up and read about the rehabilitation prisons that are the subject of this book as I grew curious about them while reading. The characters, however, were a bit harder to relate to, and I almost found the main character, Ray, to be somewhat irritating at times. I tried to figure out why, and I think it was perhaps because she was so conflicted. I find it hard to relate to characters who are going through such turmoil and are unable to remain true to themselves because they don't know why they are. I enjoyed the story, but I found that I was also waiting for something to happen a lot of the time. However, when more interesting things did start happening, the story got incredibly interesting, and quite quickly. I suppose the beginning was slower on purpose to set the scene, but I would have enjoyed a faster paced book as I am not sure everyone would continue to read through the beginning. The last parts are well worth the wait, though. I am interested to see how Lalwani will evolve as she has had an interesting life herself and as it appears that she writes about her experiences, or so it seems, I am curious about what she will write about next.